The book, The Birth of Tragedy, was written by the great German Romantic Philosopher, Friedrich Nietzsche, and was first published in 1872. In this seminal work (which ironically received an angry and critical reception at the time), Nietzsche explored classical Greek tragedy and found it to be transcendent, among the best work in human history for its capacity to encapsulate and present the complete human experience – pain and joy, heartbreak and elation. Classic Greek tragedy peered directly into the cauldron of human misery and adversity and embraced it; it validated humanity by encouraging its fellow citizens to joyfully engage in the sorrows and delights of life, for in doing so the full meaning of it might soon blossom. 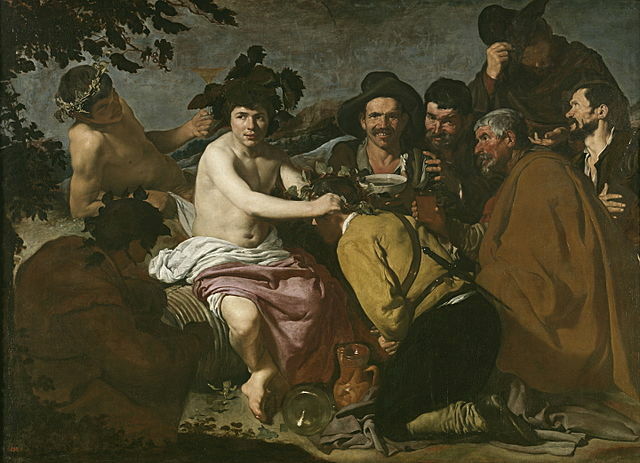 “The Drunks (Baccus Triumph)” by artist Diego Velazquez, painted in 1629, representing the Dionysian. Greek tragedy, as Nietzsche insightfully noted, achieved its brilliance through the synthesis of both Dionysian and Apollonian energies, a fusion of irrationality, passion, and wild destructiveness with restraint, order, reason and rationality. Nietzsche felt that this interplay of opposites lay at the heart of the human condition, and our greatest challenges in life involve finding ways to achieve a new synthesis between them in our own experiences. Nietzsche felt that Greek tragedy suffered with the injection of Socratic rationalism, sapping it of its Dionysian passion and fervor. This is one of my favorite books; I agree with Nietzsche’s portrayal of the human condition as an interplay between opposing energies. It is only through a careful consideration of these opposites with an eye toward evolving a new synthesis – with each of us acting as intermediaries through our own experience – that consciousness can grow.